Read the first part of our birth story here. Ah, the rain on the window, the gentle sunlight streaming in, the view of our favorite New York building fading in and out between the clouds— and a couple of monitors that no one could seem to get to work. The gorgeous view was not meant to be, and I moved down the hall to a room with windows that opened to a wall— and not, like, a wall that was a foot away, thus letting in some light. The windows were a good centimeter away from the wall, a wonder of institutional architecture. I remembered a line from my favorite birthing book, The Big Book of Birth by Erica Lyon: “If you still care about the wallpaper in your birth room when you get there, you are there too early.” Sure, I was going to be induced so there wasn’t a technical ‘too early’, but the sentiment was the same; very soon, there was going to come a time— the important time— when I couldn’t care less about the quality of light in the room or the Chrysler or any other building. I chose not to write a formal birth plan, as I had discussed all of my preferences and options with all of the doctors in the practice (who would be the attending physicians during my labor) and I wanted to discuss face-to-face those same topics with all of the providers I hadn’t met (the nurses and residents with whom I would be spending most of my time). I worried that a written birth plan would become a shallow substitute for real conversation throughout my labor, and I wanted to be forced to have those conversations, to confront them in real time. And despite all the books and articles I’d read, classes I’d taken, and questions I’d asked of each and every person who might have any insight whatsoever into the birthing process, I knew that I had no earthly idea what I was in for. Best to play it by ear, stay flexible, and know that Mike and I could make informed decisions at any stage in the game. That said, I’d be lying if I said I didn’t have any preferences going into the process, and I’d be lying even more if I didn’t admit that already, barely into the process, I was watching so many of those preferences fade in the rearview mirror. I had chosen a Pitocin induction, and I had solid reasons for doing so (and I truly believed that it offered me the best route to an uncomplicated vaginal delivery), but that induction meant scratching off a number of items from my ‘Dream Birth’ list. Intermittent fetal monitoring rather than continuous? Because fetal distress is more common with pitocin, continuous fetal monitoring is standard. Skipping an IV? The pitocin wasn’t going to magic itself into me. Laboring at home until the last possible minute? Clearly, that ship had sailed. But knowing these things were off the table forced me to dig deeper to understand why I had checked those boilerplate natural childbirth boxes in the first place. I didn’t want continuous monitoring or an IV not because I was afraid of them, or because I didn’t trust my providers to make judicious decisions regarding any information the monitors provided— I favored those options so that I could MOVE. I didn’t want to be tied to a bed, on my back, in a way that prevented me from coping with the pain using my own body. Even though my mobility was more limited— I couldn’t go walking the halls— it wasn’t eliminated, by any means. 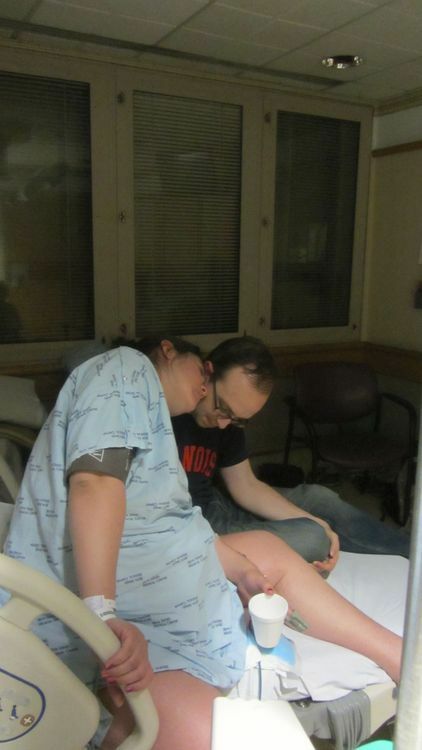 Once the Pitocin kicked in and my contractions began in earnest, I was moving: on my birth ball bouncing or doing hip circles, pacing the room, on my hands and knees on the bed, and hanging onto Mike’s neck for dear life. Mike and Jillian, our amazing doula, were right next to me through each contraction— grabbing smaller birth balls that I could squeeze during particularly strong contractions, doing Rebozo sifting to relieve some of the back labor from my stubbornly OP babe, and gently reminding me of the breathing and relaxation techniques I had been practicing for the last few months. Sure, some of the visualizations and relaxation exercises I had planned to use flew out the window as soon as I knew that the whole oxytocin-positive-feedback-loop I’d been banking on wasn’t going to happen, but our practice of Hypnobirthing and Mindful Birthing techniques was incredibly valuable, as were the breathing exercises I’d worked on from The Healing Power of the Breath. But as midnight drew near, I was running out of steam. I swear I’m not involved in some sort of hilarious bet to see how many times I can say the word Pitocin— but, y’all, that stuff is a game changer. I’d heard and read that Pitocin-induced contractions were wildly different than those experienced during spontaneous labor, and I was quickly finding out how true that was. My contractions were coming fast and strong, with almost no rest between them. I thought I surely had to be in transition, because I had hit a wall. I was exhausted and in pain that— in addition to being the worst of my life— did not quit. I couldn’t catch my breath between contractions, and the techniques that had worked so well earlier in my labor were ringing hollow. 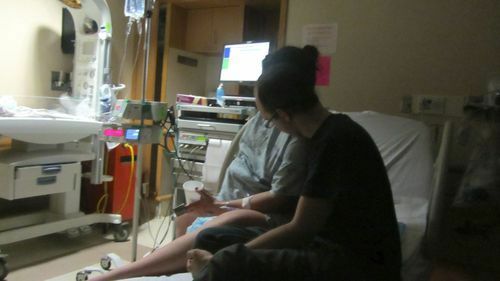 I tried every position, every breath, every visualization I could, and while they got me through those contractions, I was left with little time and even fewer emotional resources to help me recharge before the next excruciating pain hit. 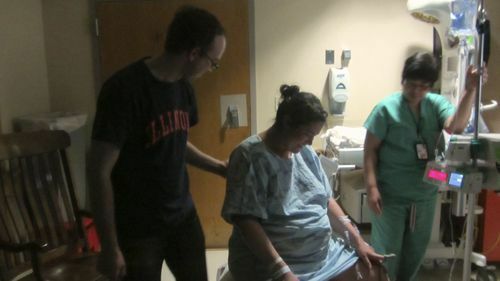 I told Jillian and Mike that I only wanted to talk about pain relief between contractions, when my head was clear and I wasn’t being swayed by what I felt in that moment. And when I stopped being able to differentiate when that time was, I knew that I needed to explore my pain management options. Again I was forced to dig deeper and ask myself why I wanted to avoid an epidural: I was afraid of a loss of mobility, I was afraid of a loss of control, and I was afraid that I wouldn’t be able to push my baby out. But I couldn’t be mobile in the pain I was in— it was all I could do to start to change positions after the end of a contraction before the next one hit. More than once I was caught with one leg off the bed and one leg on or just out of reach of the ball I’d been lunging for when I was consumed with pain. The pain was impacting my mobility, rather than the other way around. And if this kept up, there was no way I would have the energy to push; I was already falling into a nightmare-like state of exhaustion in the seconds between contractions. After several fifteen second chunks of conversation with Jillian and Michael— and after more than a few ‘Let’s just try one more contraction’— I knew that either I had to be getting close to the end, or I needed more relief than I was able to give myself. Jillian found the attending physician, and I asked her to perform a cervical check to see how far along I was before I decided to have an epidural. I had come in two and half centimeters dilated, so after twelve hours of labor, I expected to be at least six centimeters. If this was the last stage of active labor, and I was close to full dilation, maybe I could power through. She checked, and I waited with bated breath. I WAS THREE AND A HALF ARE YOU KIDDING ME. One centimeter’s progress in TWELVE HOURS. I swore profusely, so profusely and so skillfully, in fact, that one of the doctors had to retreat to the corner to get her laughter under control. Please, someone, find my new best friend the anesthesiologist AND FAST. I got the epidural— during which I was certain I was going to render myself permanently incapacitated by wildly flailing during a contraction, which you’ll be glad to know I avoided (as an aside— what kind of horrible joke is it that you have to endure horrendous contractions and hold perfectly still while you’re having the medicine administered that you need to get those thrash-inducing pain-nadoes under control?). I had two more killer contractions, and then magic happened. Blissfully, I started to feel only pressure. I could still move my legs, still sit up, still feel that a contraction was happening— but now I could talk, I could focus on the fact that BABY was near, and WONDER OF ALL WONDERS: I could sleep. I slept on and off for the next six hours. Six delightful hours of rest, interspersed with conversations not laden with expletives about things other than crippling pain. After six hours, at which point I might have appreciated the beautiful sun currently rising above the skyline in my previous room (HEY GUESS WHAT I CARE ABOUT THE WALLPAPER AGAIN), I started feeling some discomfort that required those same pain management techniques from earlier. As the pain in my tailbone grew stronger, I asked a doctor if we should think about turning up that epidural. Yes, I drank the epidural koolaid, and I would have drunk the epidural straight from the bag if they’d let me, too. As she checked my dilation, her eyes grew wide. ”No way,” she muttered. ”NO WAY. Oh my god oh my god NO WAY.” All kinds of situations ran through my head. If my three and a half centimeters of dilation, my blood sweat and tears three and a half centimeters that I had been working on for WEEKS had disappeared, I was definitely going to take off an appendage from someone, and soon. ”You’re fully,” she said, because as I learned, nobody says fully dilated, maybe because they’re too used to people shrieking with joy once they get to “You’re f-“. I surely did. Just to recap, for those of you keeping score: twelve hours of painful, intense, oh-god-kill-me-now-in-a-metaphorical-sense-of-course-but-actually-that-last-contraction-made-me-reconsider-my-qualification-of-metaphorical contractions? One cm dilation. Six hours of blissful rest, including some solid honest-to-goodness sleep? ALL OF THE OTHER CENTIMETERS. Which is six and a half, and that’s a lot of damned centimeters. Perfect. Now all I had to do was get this baby out.